The dining room lit up for service. All photos courtesy of Excelsior Hote Gallia. All eyes are on the business capital of Italy as EXPO Milano 2015 opens for its six-month run. 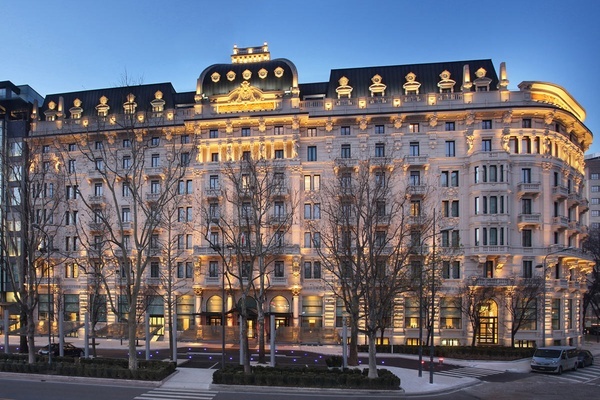 The city has been abuzz with openings and preparations in the lead-up to the festival, including new hotels like the recently renovated Excelsior Hotel Gallia. Contributing editor Erica Firpo checks in and finds Gatsby-esque splendor. "...and to this conception, he was faithful to the end." The Great Gatsby, F. Scott Fitzgerald, 1925. MILAN – I will admit it. I am a Gatsby, a wide-eyed dreamer with ideas of skyscrapers and all-night parties, luscious marble, loose morals, endless cocktails, and theatrical architecture. 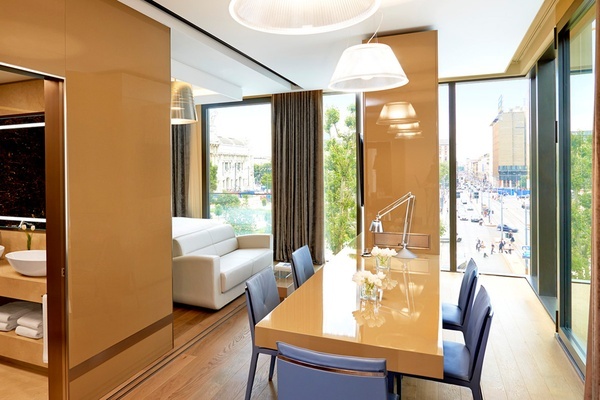 Milan is the perfect setting for a Fitzgerald rhapsody, from its Art Nouveau buildings with gorgeous moldings and its sharp Art Deco palazzi to its modern, shiny new towers. The city has the uncanny ability to transform itself from quiet and reserved to decadent, bombastic, and monumental. And lately, I've noticed that Milan architecture is living up to the most fundamental of Gatsby creed: If you want to woo a Daisy Buchanan, you have to bring the best to West Egg. 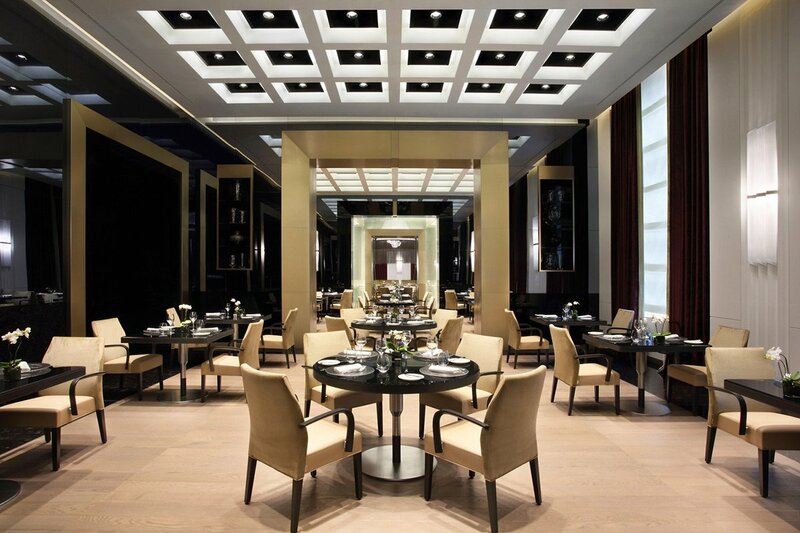 Case in point: Excelsior Hotel Gallia, a Luxury Collection Hotel, one of the latest openings in Milan. For years, I've had my eye on the Hotel Gallia. Every time I walked around Stazione Central (Milan's central train station, located directly in front of the hotel), I studied the Gallia's Art Nouveau/Art Deco façade wondering what was going on inside. Would it be left to the vultures of railway hotels? Would it subdivided into offices? Would it become an H&M? 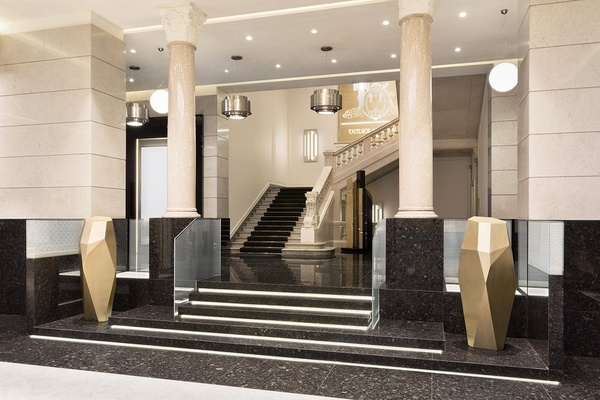 While I thought the Gallia was hibernating, architect Marco Piva was renovating, gutting the 1932 historic hotel to its marble lobby and columns and rebuilding it into a modern luxury hotel that maintained the Art Nouveau/Art Deco style using only the very best materials. A peak at the lobby. Gallia is all marble, light, and lines. When I visited recently, I bumped into Piva in the orange-blossom scented lobby and had the pleasure of talking with him about flow, furniture, and font. 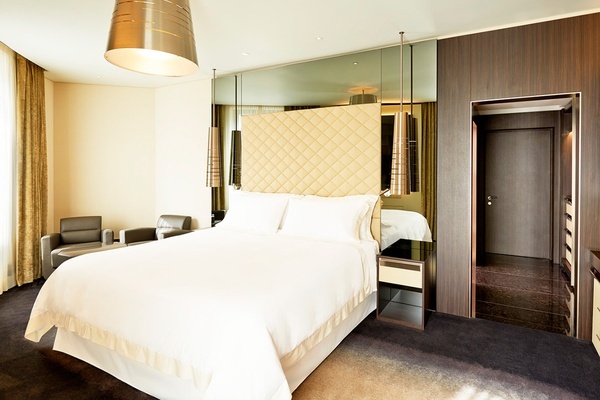 Piva was inspired by Art Deco and incorporates its elements throughout the hotel. He avoided creating a period piece by decorating with 21st-century design and furniture. He worked with Poltrona Frau, Flos, Fendi Casa, and Cassina to create unique pieces that show off the very best of Italian design. He had his eye and finger on every color and material (marbles, metal, leather, and woods) used throughout the hotel. Pops of color in the Art Suite. The seven-floor hotel is lush and luminous. The sprawling ground floor area is a 21st-century Gatsby hangout area of high ceilings and marble, with a lounge, well-stocked library, cigar bar, restaurant, and cocktail bar accented by light hues, warm fabrics, and Poltrona Frau furniture. From floors two to seven, its 235 rooms are beautiful and smart, with technology and style. I loved the outlets, nightlights, Trussardi amenities, Marvis mouthwash, Domori chocolate bars, the marble and glass bathroom, and, of course, the view of Stazione Centrale, my favorite train station in the world. I even loved the "lobbies" on every floor for their fluorescent yellow accents and Barbarella-reminicent sofas. The suites were delicious. I toured the penthouse Katari suite before it was decorated and it already looked amazing. My favorite is in the Art Suite which swims in light and has butter-colored quilted leather accents. Piva's love for architecture and design is most obvious in the five suites he dedicated to Italian architects Gio Ponti, Achille Castiglioni, Vico Magistretti, Luigi Caccia Dominioni, and Franco Albini. In Piva style, he incorporates elements from each architect into the suites. When I visited early on, the spa and palestra (gym) were completed but not yet open. The sixth floor is all about the body: a Shiseido spa, a state-of-the art gym, and a virtual golf course. The 7th floor will soon be home to a rooftop restaurant and bar that will stakes their claim in the city's no-bar-and-restaurant scene in splendid futurist Art Deco style. The restaurant was almost complete, though chef has yet to be announced. This post was originally posted on Erica's blog and is reprinted here with permission.